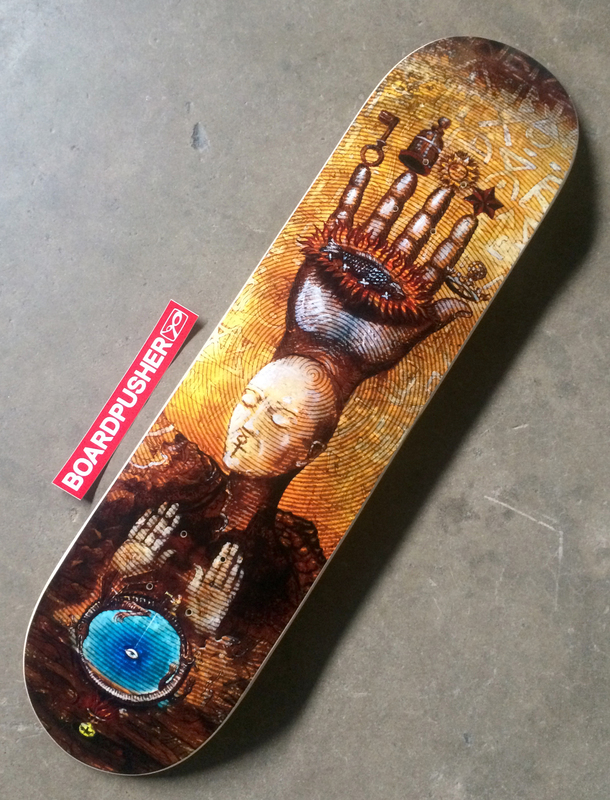 Today’s BoardPusher.com Featured Deck comes from Vasily Kafanov‘s sessions while working on the artwork for the Machina/The Machines of God album by The Smashing Pumpkins. 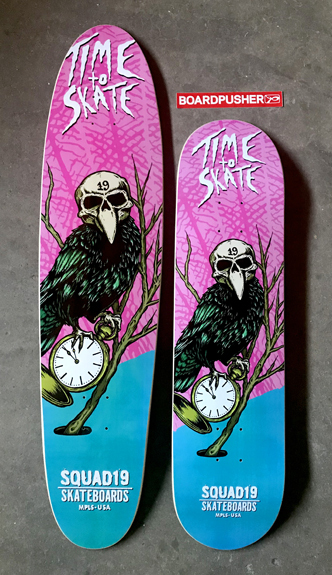 You can find more of Vasily’s skateboard graphics at kafanov.com/store-art-objects or follow him on Instagram @fishtower. Any art project can become a custom skateboard graphic at BoardPusher.com. 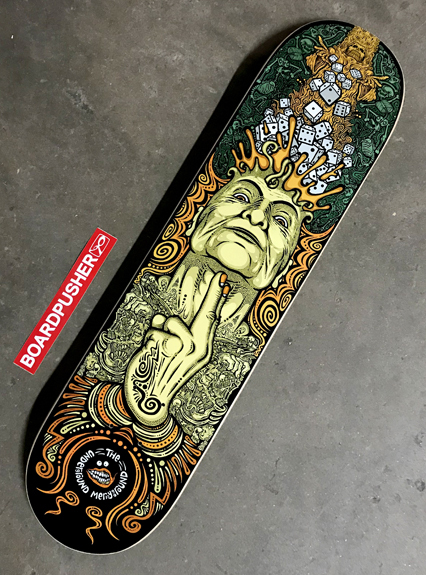 We’re stoked to share another one of Tim Naish’s extremely intricate skateboard graphics from his Underground Merry-go-round for today’s BoardPusher.com Featured Deck. “Dicing With Death” is Tim’s latest creation and it can be found next to all of his other highly-detailed skateboard designs at BoardPusher.com/shop/the_U_M. You can stay updated with Tim’s latest creations at timnaish.co.uk or by following him on Instagram @tim.naish. We handle every graphic with care and an attention to detail when you create a custom skateboard at BoardPusher.com. Mister Kobayashi brings his Japanese art style to Brooklyn with today’s BoardPusher.com Featured Decks from his Tokyo Town series. 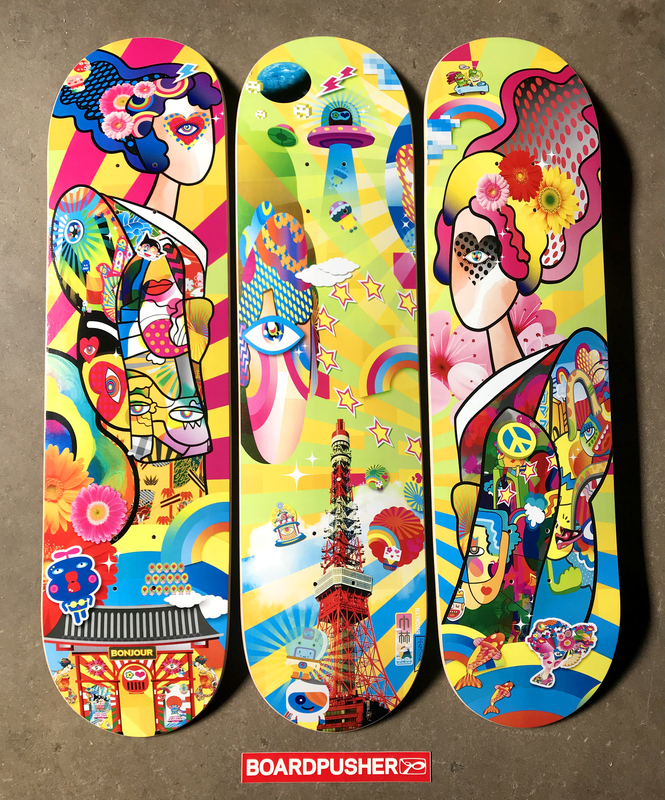 You can follow him on Instagram @mister.kobayashi and find these boards and the rest of the series available for purchase at BoardPusher.com/shop/harumaki. 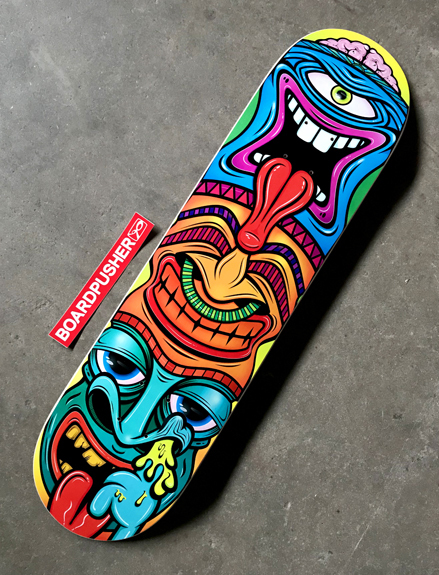 Every culture can become skate culture with a custom skateboard from BoardPusher.com. World renowned death metal artist Mark Riddick recently updated his BoardPusher shop with some new skateboard graphics, and here’s the first Featured Deck of the bunch. 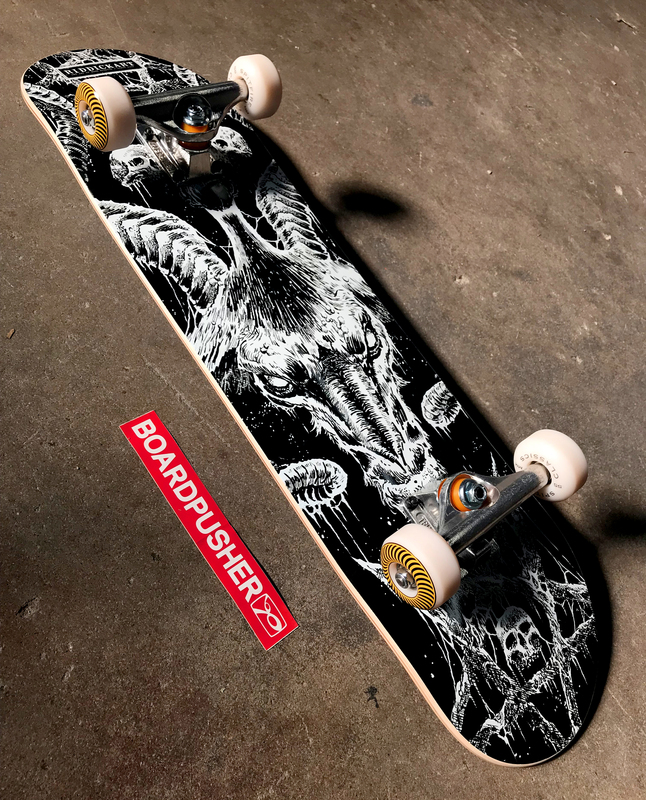 This Baphomet design was made complete at BoardPusher.com with Spitfire Wheels and Independent Trucks. Find more of Mark’s artwork at riddickart.com, follow him on Instagram @riddickart, or pick up one of his skateboard designs at BoardPusher.com/shop/riddickart. Whether you’re a professional artist, just getting started, or somewhere in between, it’s easy to turn your creations into a custom skateboard graphic at BoardPusher.com. We’ve always appreciated Lou Simeone’s colorful and bold skateboard graphics, including this fresh take on the classic Tiki design. Now all of Lou’s skateboards, like today’s Featured Deck, are available for purchase at BoardPusher.com/shop/simeonegraphix. You can also follow Lou on Instagram @simeonegraphix. Show off your unique style with a custom skateboard graphic from BoardPusher.com. 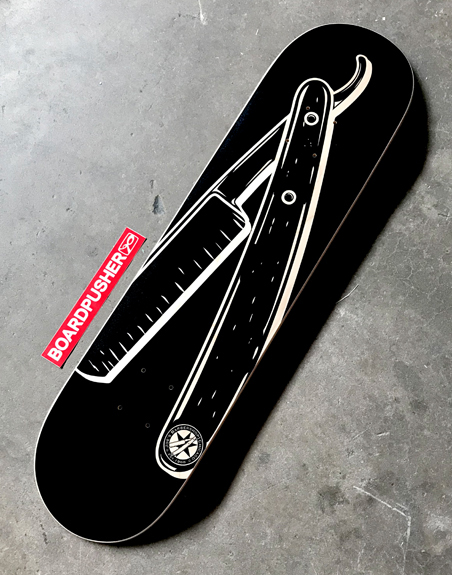 Today’s BoardPusher Featured Deck was created by the folks over at Joe’s Barbershop in Chicago to celebrate their 50th anniversary. Since the shop opened in ’68 only 68 were made and you can pick one up here. Commemorate a major milestone in your life with a custom skateboard you can create yourself at BoardPusher.com. Here are two more additions to the Sweethearts Salute series created by photographer Victoria Allen to benefit the Semper Fi Fund. To purchase these BoardPusher.com Featured Decks, and several other pin-up girl skateboards, head over to BoardPusher.com/shop/VictoriaAllen. 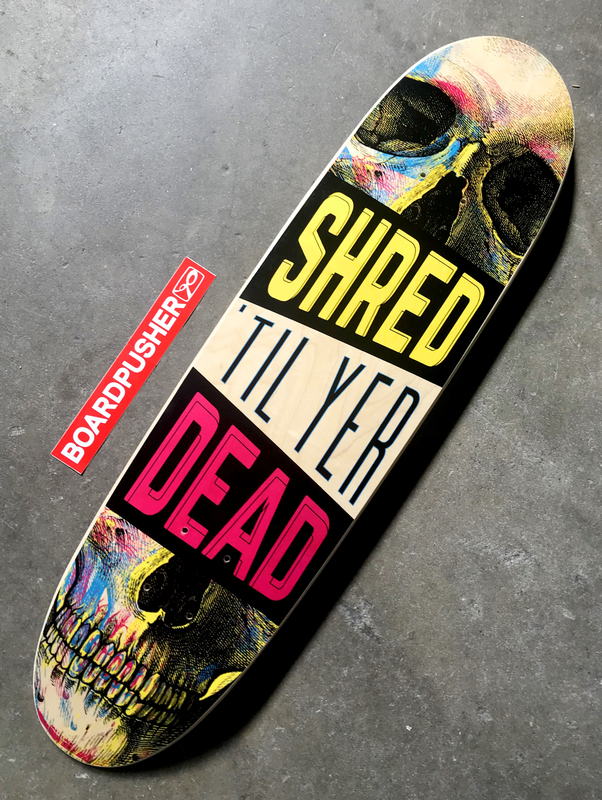 Upload your photos and images at BoardPusher.com to create your own custom skateboard graphic. We agree with the sentiment expressed on this custom cruiser board created by Taylor Browne for her Graphic Design 3 class. So much so that we made it today’s BoardPusher.com Featured Deck. You can follow Taylor on Instagram @enworbrolyat. 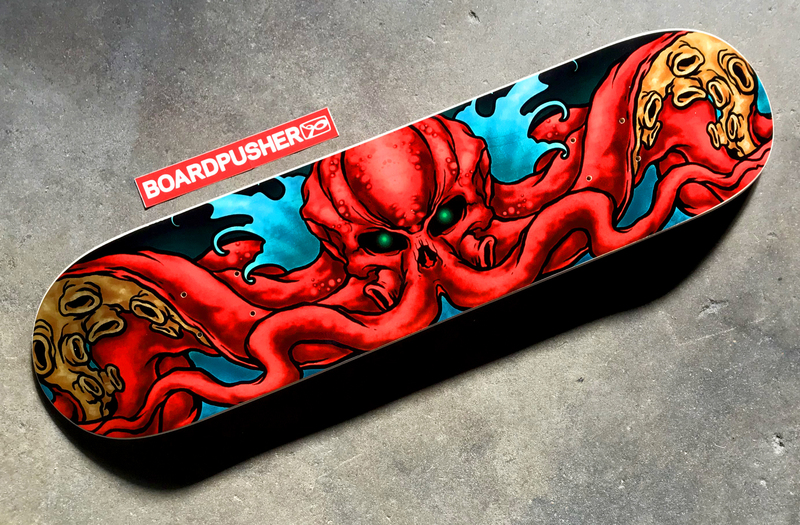 Design your own custom cruiser deck at BoardPusher.com.